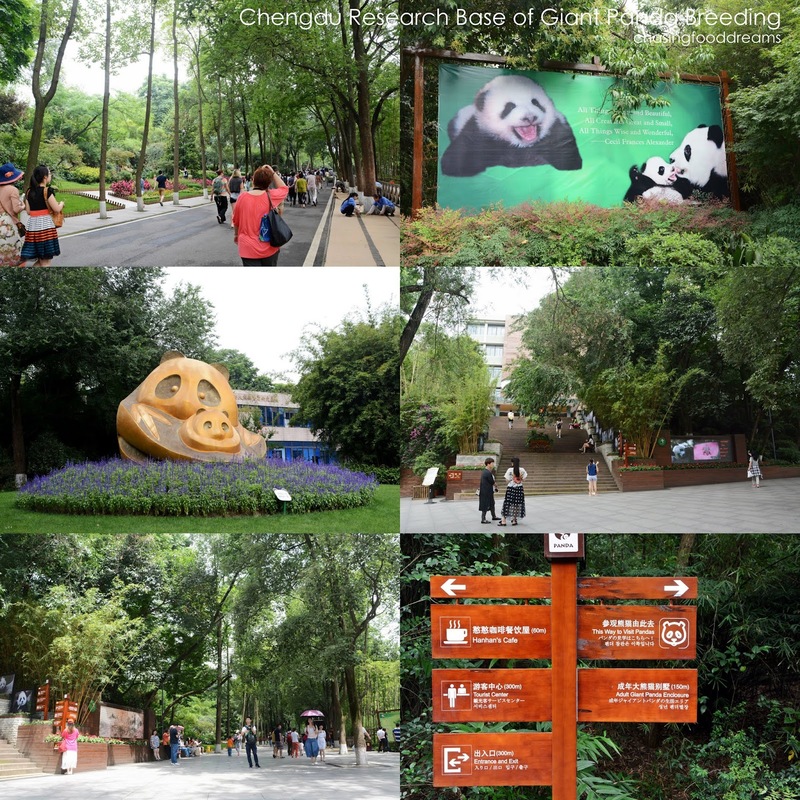 Where To Go and What To Do in Chengdu! 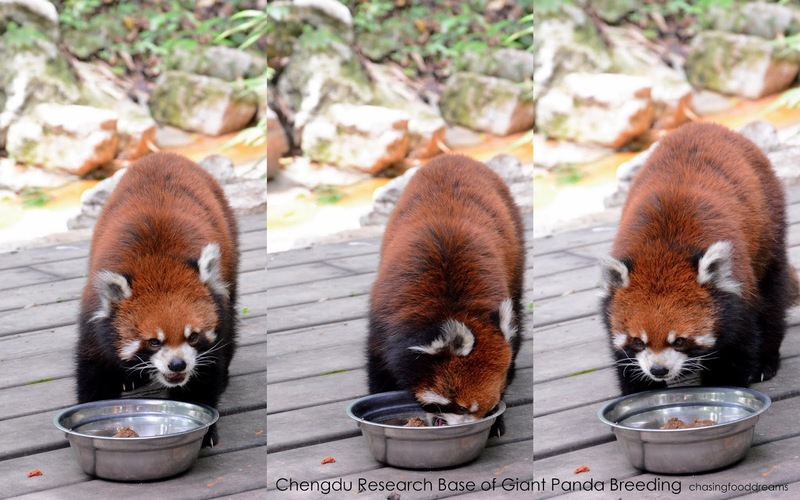 My final part on the amazing trip to Chengdu, China, is also the most interesting part. China is full of various culture, heritage and history. From the many dynasties it has through time, China today has an amazing historical background and places to visit. One needs to plan your visit wisely as there are many places to visit in Chengdu as well as the surrounding area outside the city of Chengdu. From panda visitation to historical sites, cultural villages, shopping and night life, we could barely cover much in a few days. However, we did pretty well in some ways and covered a little of everything within our trip. As some of these places are huge, expect lots of walking and one will need comfortable shoes as well. Simply a Must-visit in Chengdu, the Chengdu Research Base of Giant Panda Breeding is dedicated to giant panda conservation. The park is huge and is amazingly beautiful and green. With numerous accolades under its belt, the conservation park is a favorite spot for tourist and many locals as well. Go early to catch the pandas in action. The whole park is pretty shaded with lots of greens everywhere, especially bamboo. The park is sectioned into several enclosures for the pandas as they are quite the solitary animals. I managed to catch the adult giant panda and some young pandas. It is such an amazing sight and I even catch one quite close. They looked so gentle despite their size. There is also the baby panda and nursery but I missed that. Surprisingly, there were quite a few peacocks there too. As soon as I try to take a photo, this peacock immediately showed off the proud gorgeous feathers. Besides that, there were also swans, flamingos and other birds. 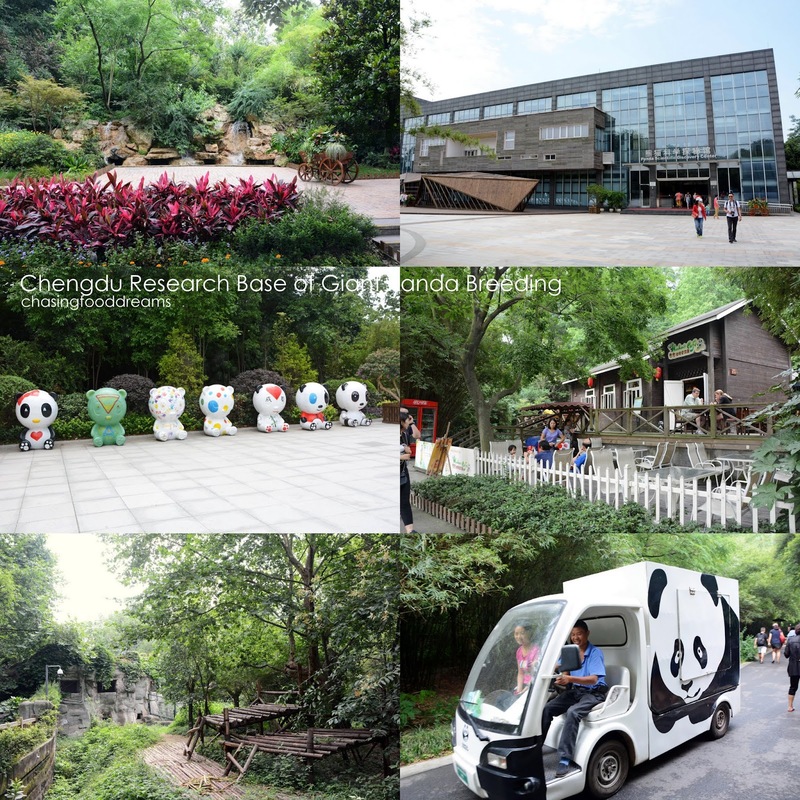 There is also a lake as well as Giant Panda museum, Panda Story Cinema, souvenir shop and restaurants as well as a veterinary hospital. It’s a truly beautiful place to visit! 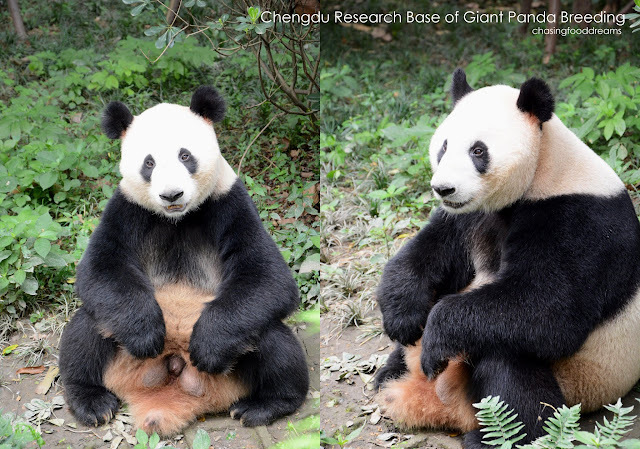 Giant Panda in full glory! 1375, Panda Road, Northern Suburb, Chengdu. Founded in 2001 in Chengdu, the Jinsha Site dates back to 12th to 7thcentry B.C. 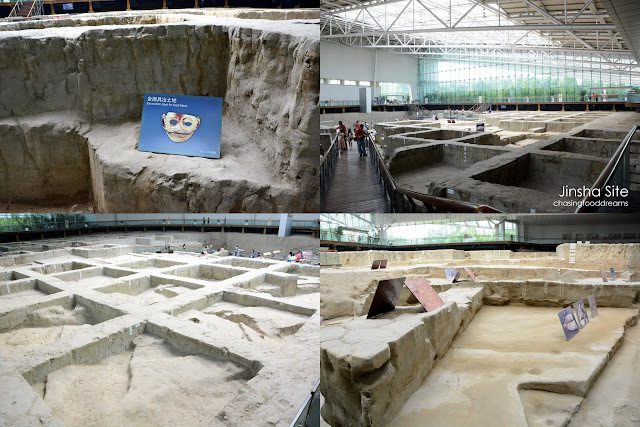 Listed under one of the Ten Major Archaelogical Discoveries of China in 2001, the Jinsha site was the capital of the ancient Shu Kingdom. 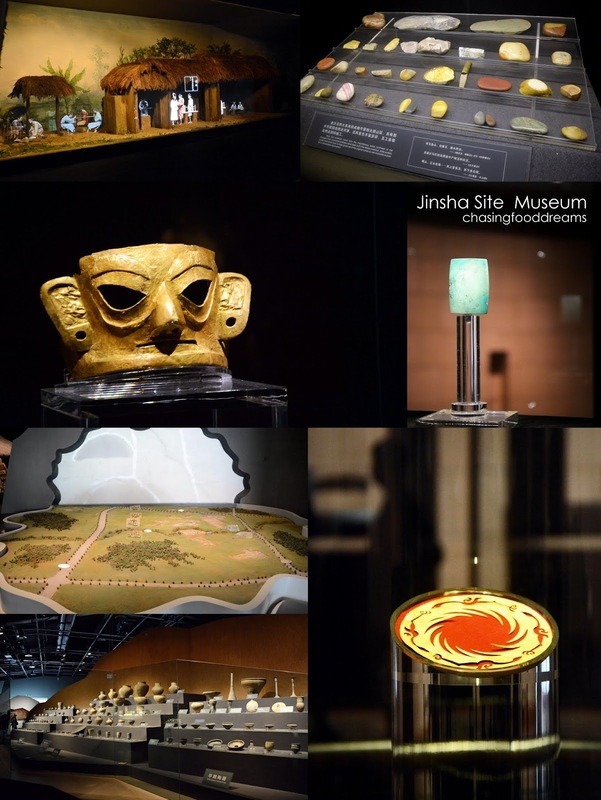 The museum consists of the center of conservation and restoration, the center of cultural communication, the exhibition hall, the theme park, Jinsha deer park and the relic hall which has many artifacts excavated from the ruins. 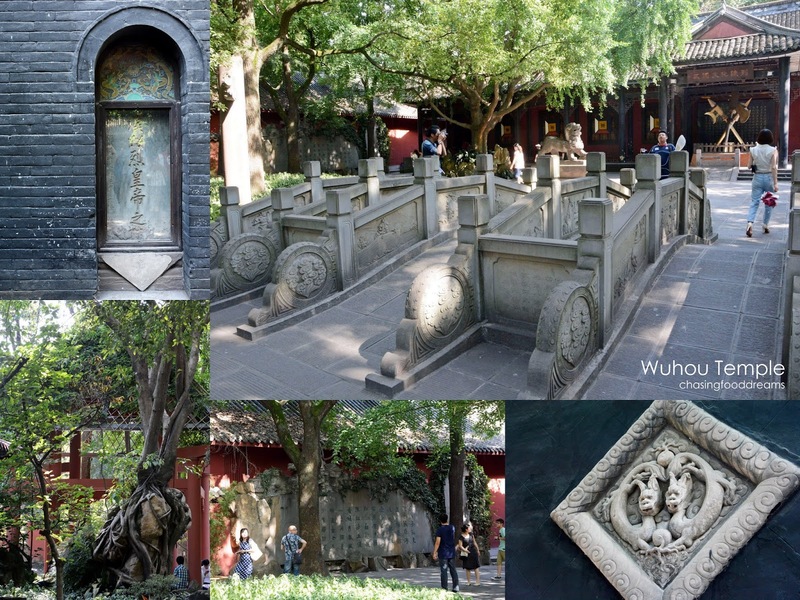 I was really impressed are how much effort they pride themselves in recovering the history of the Shu civilization. This kingdom was believed to be one of the richest kingdom as more than 6000 relics of gold, bronze, jade, ivory, stone, elephant tusk and more was found. Some of the famous relic includes Sun and Immortal Bird Gold Ornament, The Gold Mask and Bronze Standing Figure. One of the largest Giant Ebony was also unearthed in Qingbaijiang district of Chengdu. This giant ebony on displayed was believed to be more than 1000 year-old tree old and carbonized for 6500 years. No.2 Jinsha Site Road, Chengxi, Chengdu. 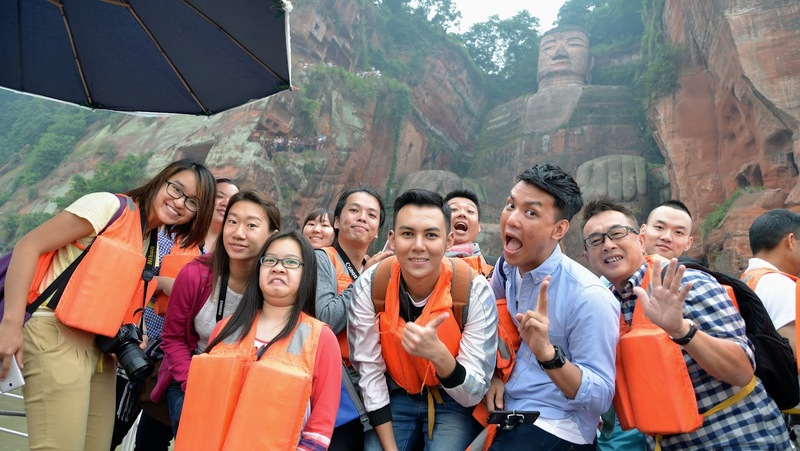 Leshan Giant Buddha or Leshan Dafo is a magnificent tall stone statue carved out of a cliff. The 233 feet Buddha is the largest stone Buddha in the world. Built during the Tang Dynasty, Leshan Giant Buddha scenic area has been listed as a UNESCO World Heritage Site since 1996. The project to build this Buddha took 90 years to complete. The Buddha statue project was started in 713 A.D. and was led by a Chinese monk named Haitong with hopes of the Buddha blessing the turbulent waters that plagues the ships on the river. 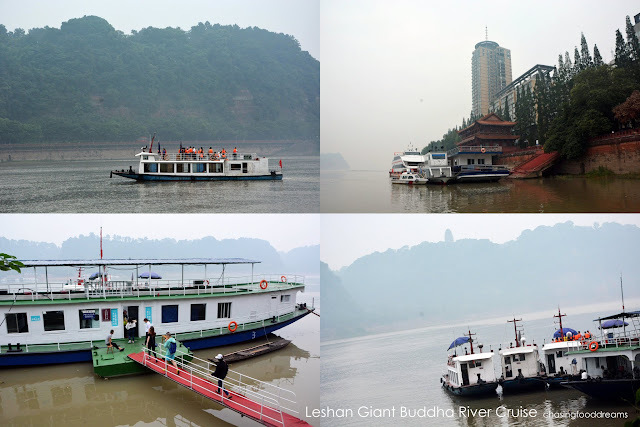 Today, one can either catch sight of the Buddha by boat along the river or if you are up to it, you can visit the site and climb the long flight of stairs carved into the cliff. The Buddha is also guarded by two guardians built on each side of the cliff. 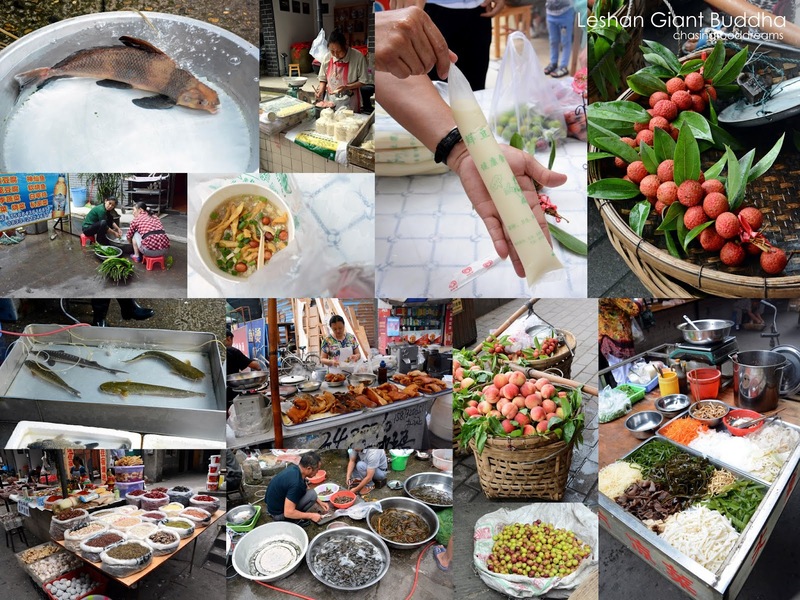 We also caught sight of the morning market after we completed our boat ride and it was a bustling sight of the freshest produce of Chengdu. There were also plenty of fishes to be sold alive. 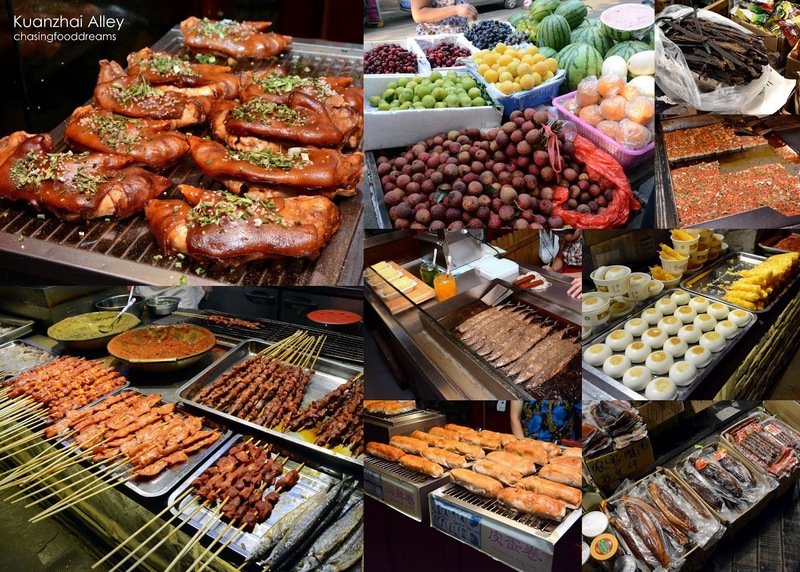 The sight of spices, legumes, vegetables, fruits, meat and more is my kind of sight. I also caught a lady using an old pounding gadget to pound her chilies. 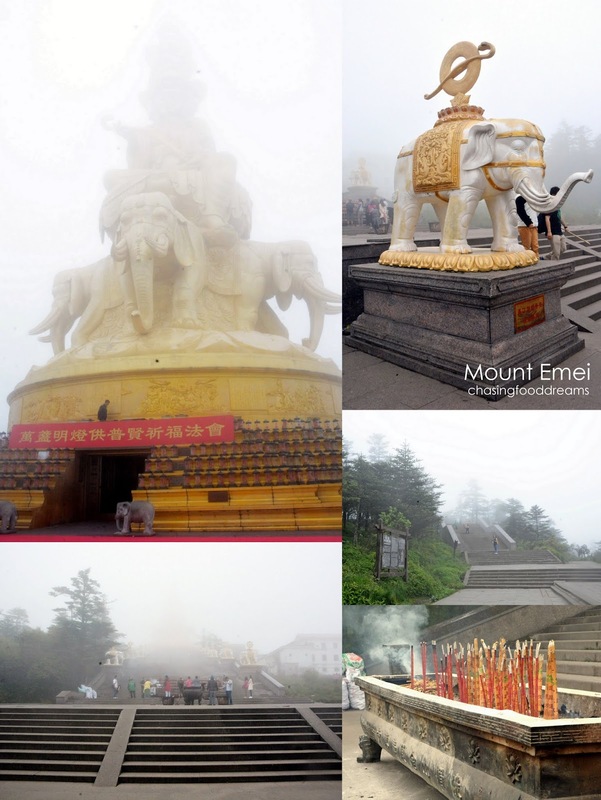 One of the Four Sacred Buddhist Mountains of China, Mount Emei or Emei Shan sits on the western rim of Sichuan. Mount Emei is 150km from Chengdu. 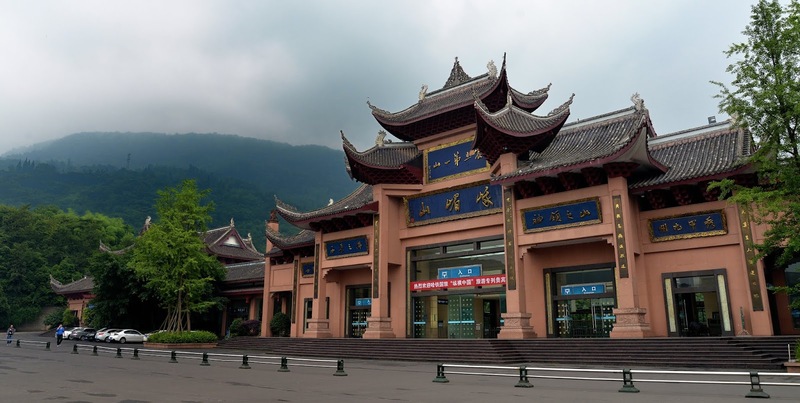 One can catch the train or bus to the main gate of Baoguo Temple and then switch to the buses going up Mount Emei which is about a 2-hour winding ride. Then one has to endure a strenuous 30km hike on steep paths to the cable car station which is another few minutes ride before reaching the Golden Summit. I highly recommend wearing proper comfortable shoes along with taking some motion sickness pills for the winding road as well as investing in a bamboo hiking pole for the hike. There are jackets available for rent as well as it has a yearly average temperature of 3 degree celsius. Along the hike up, one will see many stalls selling local snacks and mushrooms. There are also wild monkey along the trail up so be careful as these monkey can be very aggressive. 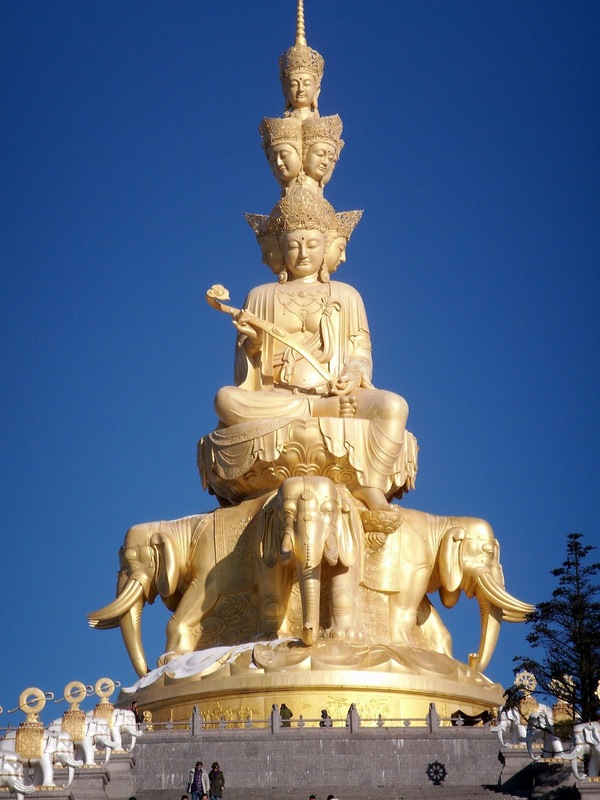 The Golden Summit has a towering multi-face statue of Samantabhadra, as well as two temples and a splendid view of the cloud sea surrounding the mountain. Unfortunately the day when I was there, it was really cloudy and foggy. There are four miracles at the summit – The Sunrise, The Sea of Clouds, Buddha’s Halo and the Holy Lamps. 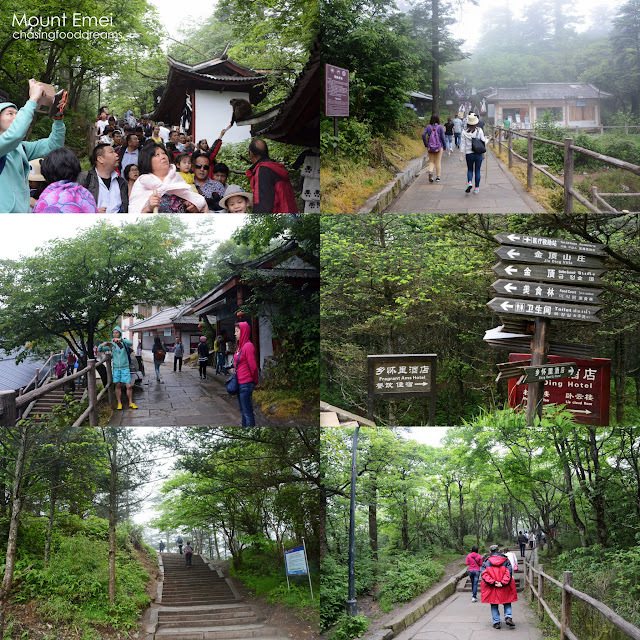 One can even stay at the many monasteries or hotels up at Mount Emei or dine there. The best time to visit are to go early and head down in the evening if you don’t plan to stay over. Cable Car station ride aprrox. 5 minutes. Eating at the top of Golden Summit can be quite fun! If you think life is difficult for you, then catch these ladies with the hefty load on their shoulders! 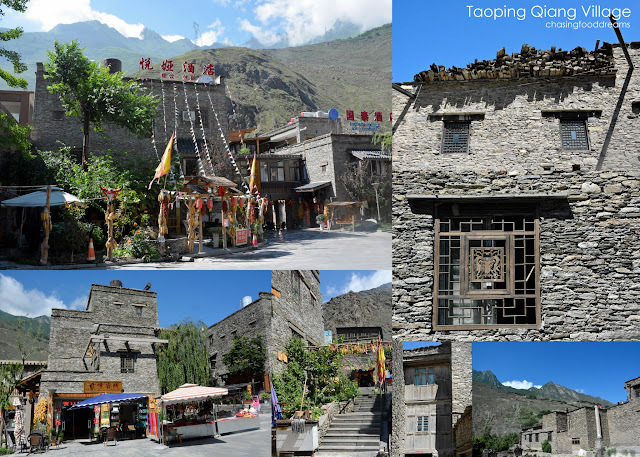 Taoping Qiang Village is about 2 hours by road transportation from Chengdu. This village is definitely a must-visit in my books. Known as The Mysterious ‘Ancient Oriental Castle’, this spot represents the unique Qiang’s architectural traditions in the Qiang village. 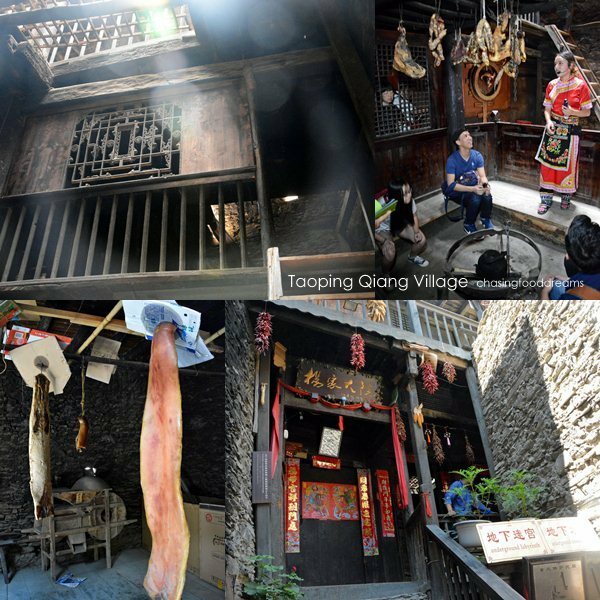 With a history of over 2000 years, Taoping Quang Village was founded in 111 B.C. 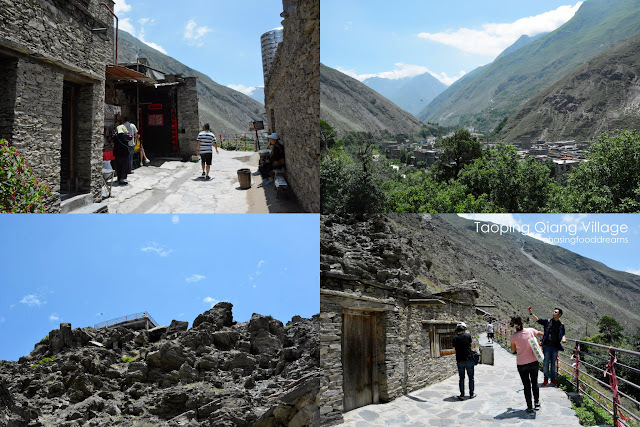 The village architecture has withstand many wars as well as natural disasters and has survived through time till current. 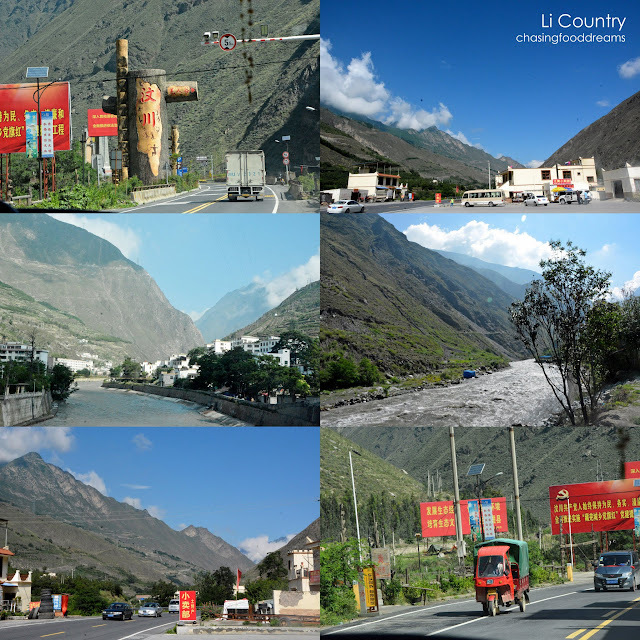 There are still Qiang people living in the village till today. We met some of the Qiang ladies and is in awe of how well they look despite being over 90 years old! Constructed with stones, wood and yellow mud, the structure of the buildings are complex, solid and built with intelligence. 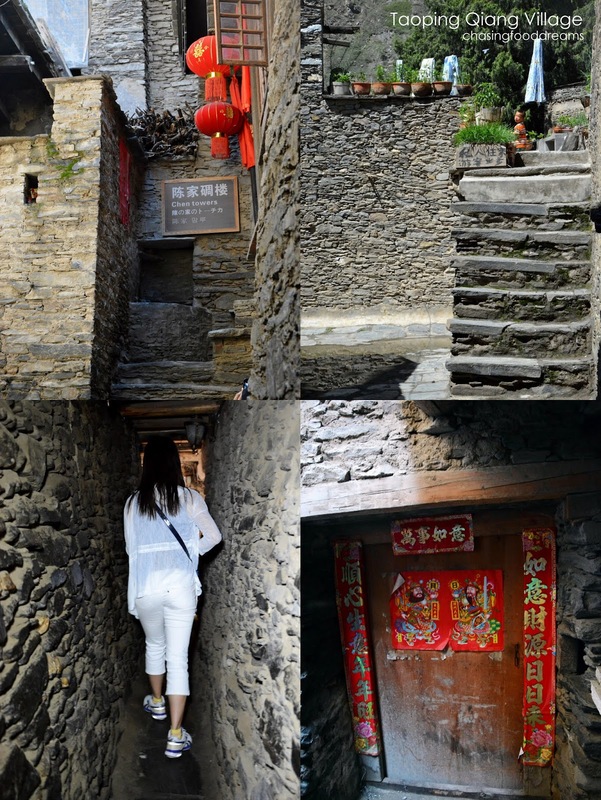 The buildings are quite small and has many small and narrow alleys which feels like a labyrinth. The underground water system is also very unique with spring water channeled to all the households. There are symbolic watchtower built on the building is used to keep an eye for enemies. 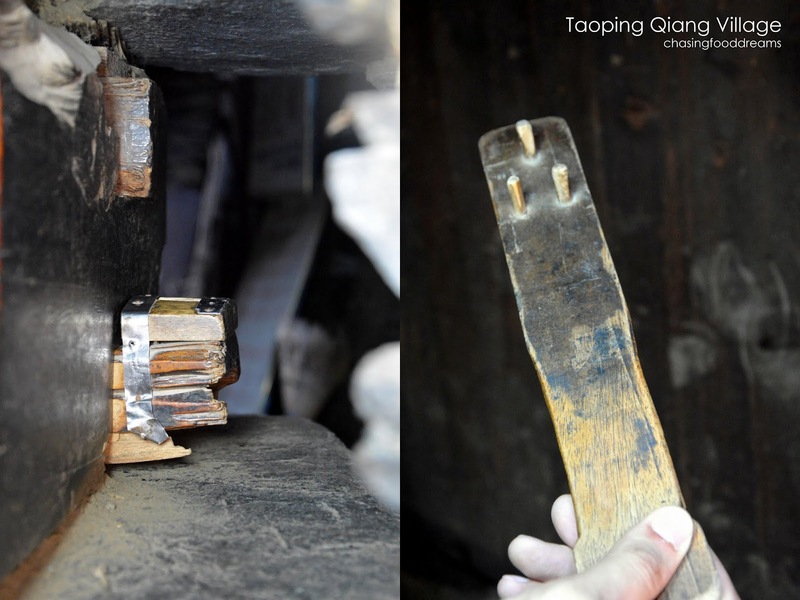 Taoping Qiang Village is not to be missed when one is in Chengdu as there are plenty to see and experience! Yang Family is the largest family in Qiang Village and their house is the largest in the village. There are Yang family members still living in the house and there are also meat still being cured the same way as before. 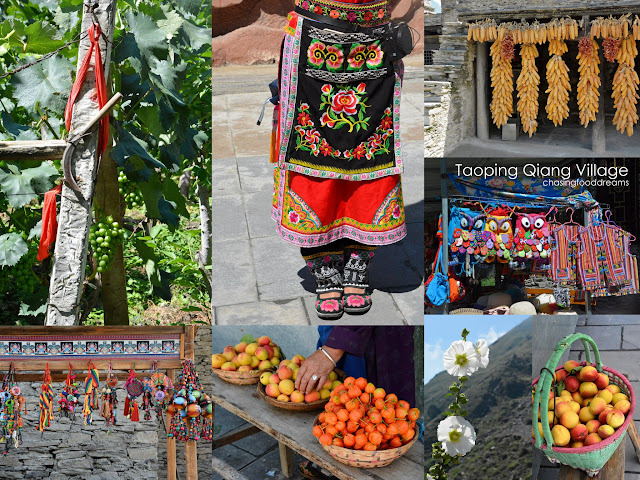 We visited one of their famous Chen watchtower which is prettily decorated with dried corn. The view is simply breath-taking! Ancient lock system where one inserts this long wooden key to open the door from inside. Notice this protruding edge on the building structures and was told that this clever architecture element allows the building to expand and reduce from nature’s elements. She’s the sweetest and healthiest 92-years old women I have ever met. 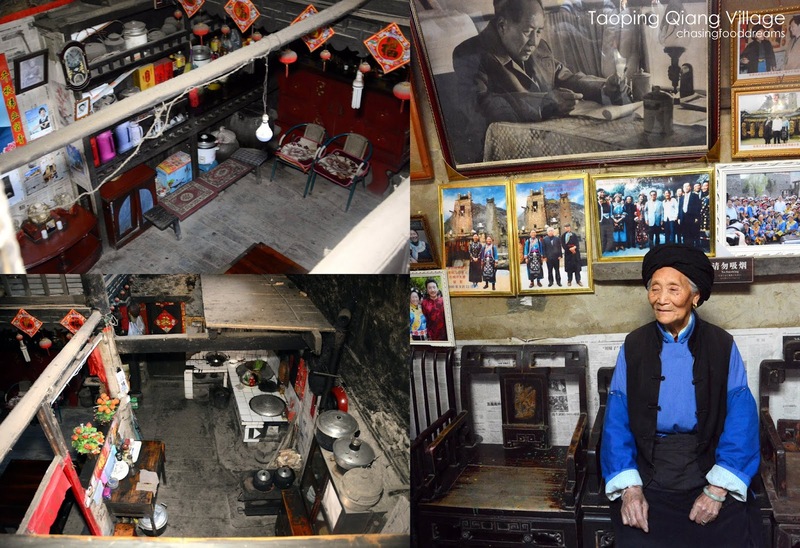 This is her house and she has gladly allowed everyone to check out her home which has many photos of yesteryears. 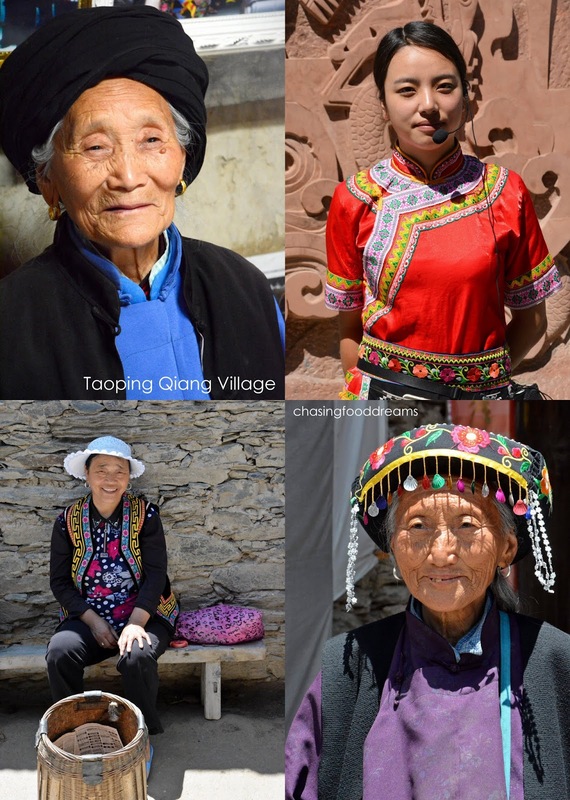 The Qiang people is also reknown for their Qiang-style embroidery, songs and dances, as well as their dried meats. There are plenty of souvenirs for sale as well as Qiang cuisine to be savored. If you are into history of the famous Three Kingdoms, you would certainly want to visit Wu Hou Temple. 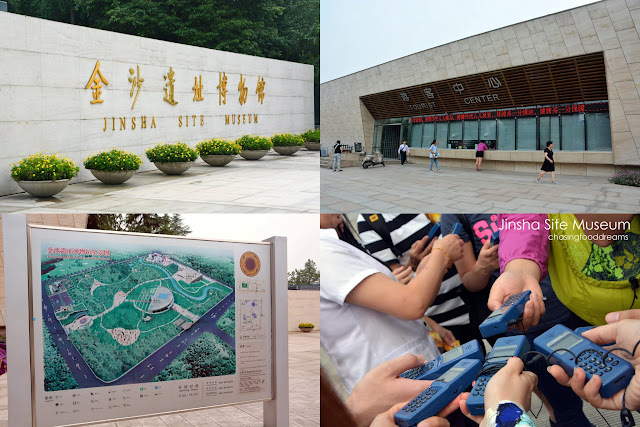 The memorial site is dedicated to the Shu Kingdom’s prime minister and military strategist Zhuge Liang and is built next to the temple of Emperor Liu Bei, the first emperor of Shu Kingdom. Thee 37,000 square meter site is a site filled with various temples, beautiful green landscapes with thousand year old trees and stones. The site is sectioned into five different sections and houses many clay sculptures of the famous officials from Shu Kingdom as well as relics and calligraphy. There are small radio devices for rent as well as tour guides to relay the history of the Shu Kingdom with additional charges as the history is complex and long. The dark wall symbolizes an emperor is behind its walls. 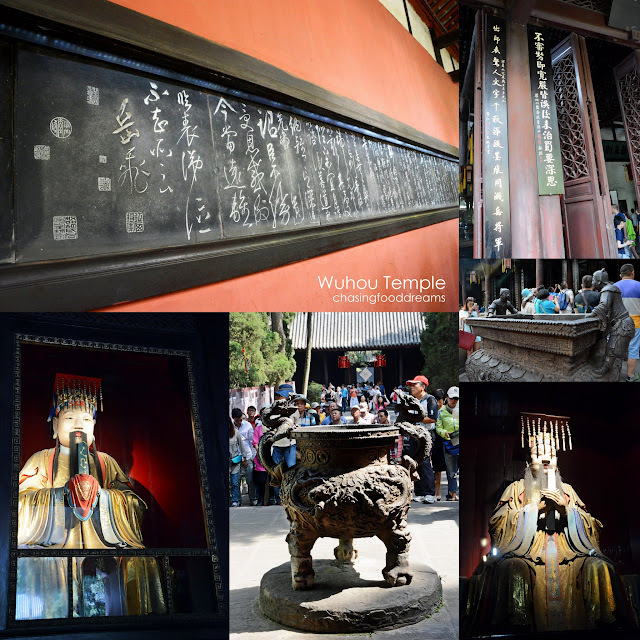 There’s quite a few temples inside the Wuhou Temple itself. This site is also has Emperor Liu Bei’s tomb. The whole place is also filled with lots of old tall trees which provided a nice cool shade for walking around. 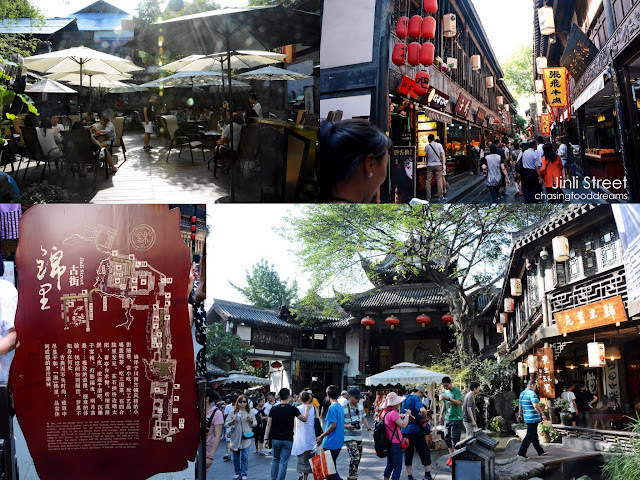 While one is visiting Wuhou Temple, one should also head on over to Jin Li Street, one of the oldest street in Chengdu. 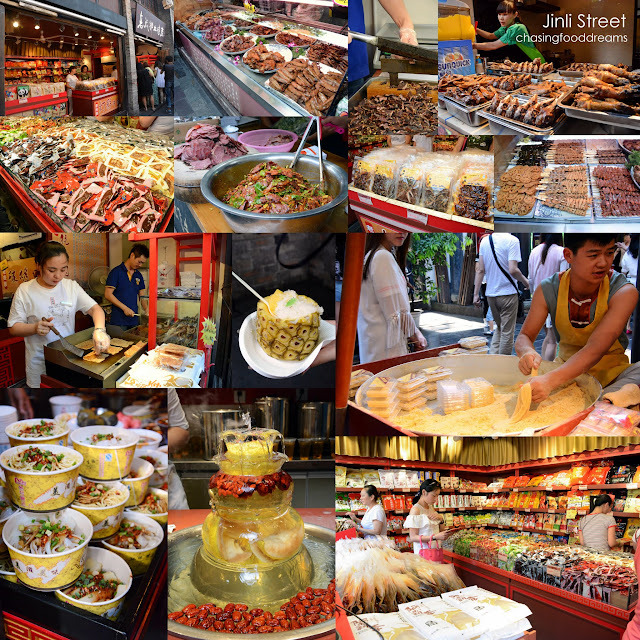 Today, it is visited by many and is always crowded as the street is now filled with many vendors selling their wares. The street was renovated in 2004 and many of the buildings are restored and updated. Today it houses street food vendors, teahouses, residences, bars and even a stage for opera performances. Walking through the street is marvelous as there are plenty for the camera lens. 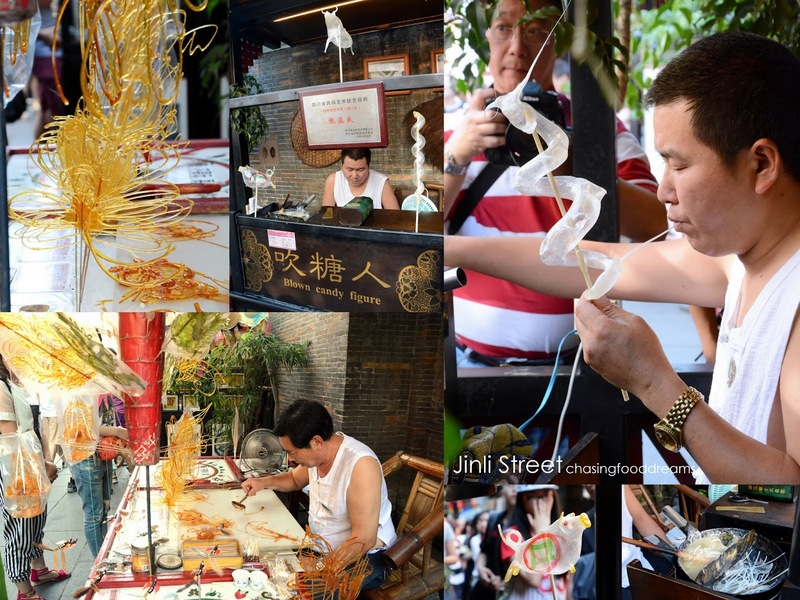 Check out the many talented Chinese art such as Blown Candy Figurine, Candy Art, Clay Art, Calligraphy and more. One can buy lots of art trinkets here! We watched in amazement as this artistic person was making blown candy art! There’s plenty of street food as mentioned in my previous post in Jin Li Street too so make sure to taste some of Chengdu’s street food. Jin Li Street is perfect for shopping as well as food and art. Another similar street filled with street food and culture of Chengdu is KuanZhai Alley. Also known as Wide and Narrow Alley, there are three parallel alleys in this area. The ancient historical alley is said to be dated back to the Qing Dynasty. After going through a series of renovation work, KuanZhai Alley opened to public in 2008. 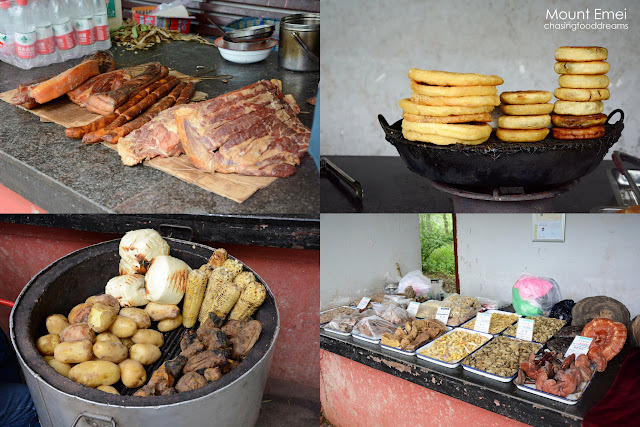 It is now a popular site for tourist and locals as there are many restaurants, bars and teahouses together with street vendors selling street food and souvenirs. Many locals visit this alley as it has become a big entertainment and night spot as well as a place for plenty of artworks. The Wide and Narrow Alley is a popular choice with tourists and locals. The night comes alive with lots of food and entertatinment at Kuanzhai Alley! 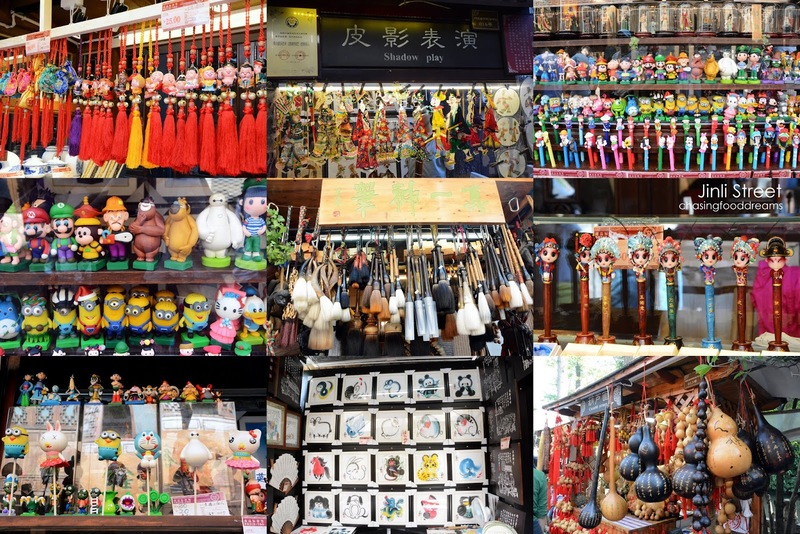 If shopping is one of your focus, then you would certainly want to visit Chun Xi Road. It is the first shopping area in Chengdu and houses plenty of large department stores with many famous brands. The many large billboards on this road reminded me of New York Times Square. The whole area is connected with a long bridge walkway. Along the wide road, there is the Yat-sen Square where a bronze statue of Dr. Sun Yat-Sen is located. For more shopping escapades, one should also visit Lotus Pool Market or HeHuaChi Distribution Center. The huge mall is a wholesale distribution center and there are plenty of shopping items for sale even if you are not a wholesaler. One can try your luck and ask for some discounts though many only allows discounts for wholesalers. Fashion wear, jewelry, fashion accessories, and more are available at this market. We also bought quite a bit of souvenirs from here as they are cheaper than other places. Saw this pineapple vendor painstakingly cutting fresh pineapples so prettily. 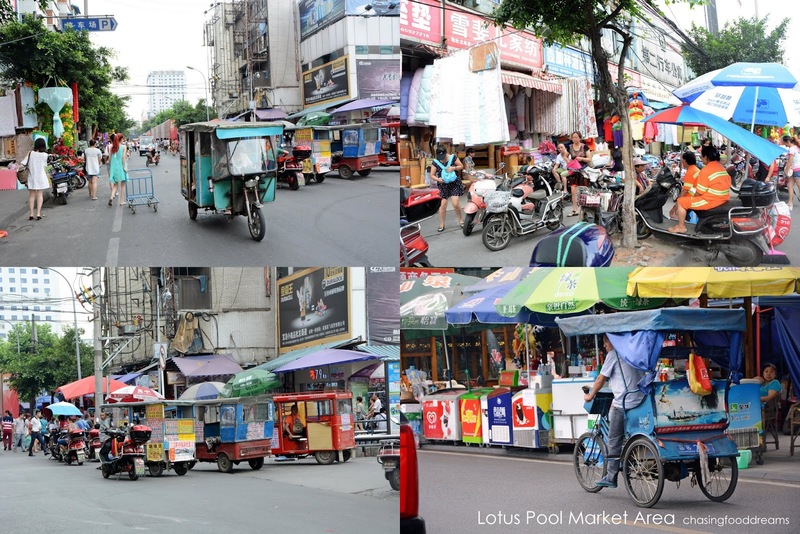 There’s plenty of shops outside the Lotus Pool Market so there’s plenty to shop till you drop! 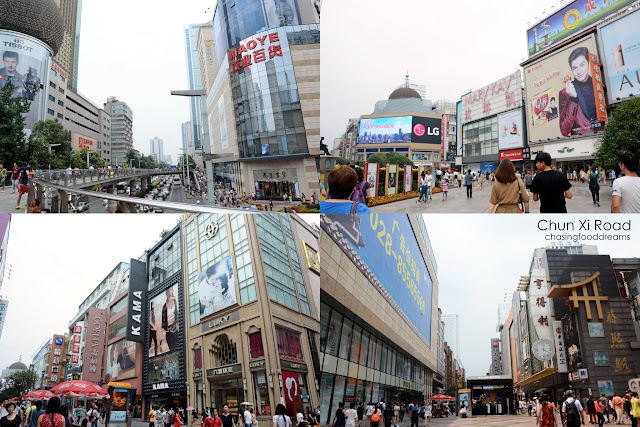 Located in the prime business district of Chengdu, the IFS (International Finance Square) Mall is renowned for high end fashion labels. Offering premium and luxury goods, the mall also houses entertainment and high end restaurants. Opened in January 2014, the 206,000 sqm Chengdu IFS Mall is a popular spot because it has a giant panda structure on the building to represent the panda climbing into the building. Make sure to go to the rooftop of the mall to take photos with the panda face! IFS is easily reachable by Chengdu Metro Line 2, at the Chunxi Lu (春熙路) stop. Chengdu has been an amazing trip! 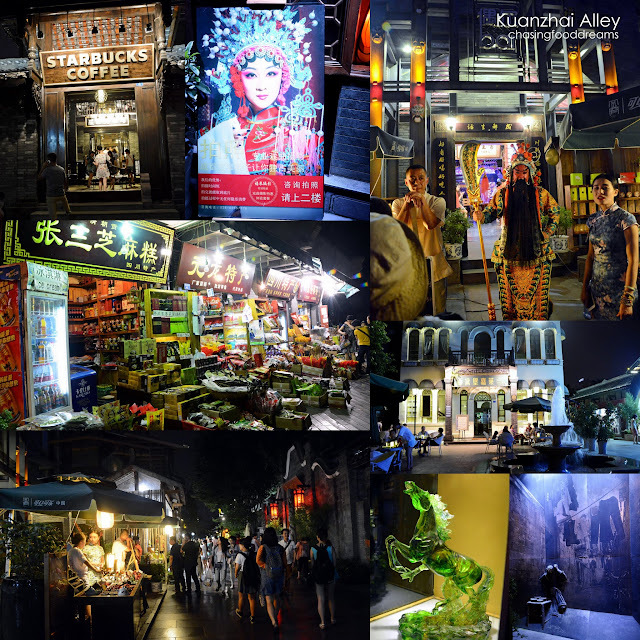 With plenty to see, eat, buy, learn and experience, Chengdu has so much more to offer than what I have covered. 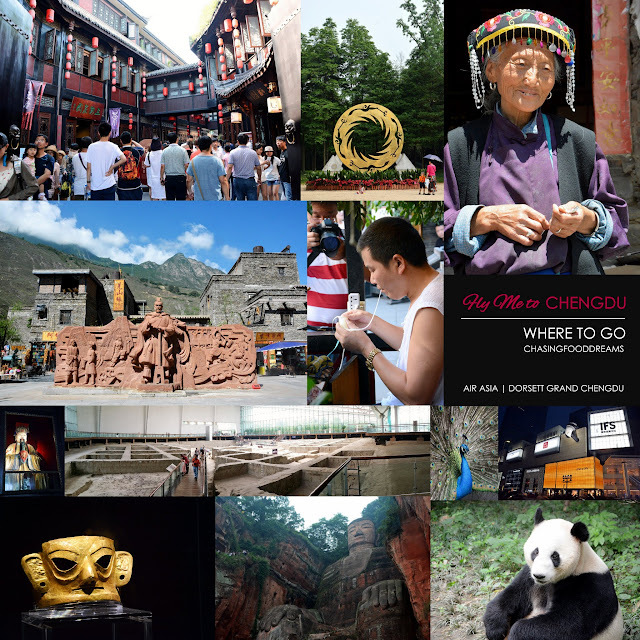 There are certainly many more places to visit in Chengdu and it is now made possible with direct flights from Air Asia at affordable prices. One should also check out Dorsett Grand Chengdu as the five-star hotel is located in a prime area with plenty of attractions nearby. I hope to return one day with my family to Chengdu to visit the enchanting JiuZhai Gou as well as other gorgeous places in the Heavenly State. Once again, this media FAM trip is made possible by Air Asia and Dorsett Grand Chengdu. Thank you for the warm hospitality! Indeed, after reading it.... really, I want to fly to 'Chengdu' a lot to see ! thanks for the effort of posting and categorizing in this 3 part series.